Polls in the first two states that will hold presidential nomination contests early next year – Iowa and New Hampshire – show a surge in support among Democrats for Mayor Pete Buttigieg even as former Vice President Joe Biden and Sen. Bernie Sanders remain the front-runners. A Monmouth University Poll of Iowa Democratic voters released Thursday shows Biden, who is expected to enter the race later this month, with the support of 27 percent of those who say they’re likely to attend the state’s caucuses in February 2020. Biden is followed by Sanders, a self-described democratic socialist, at 16 percent. 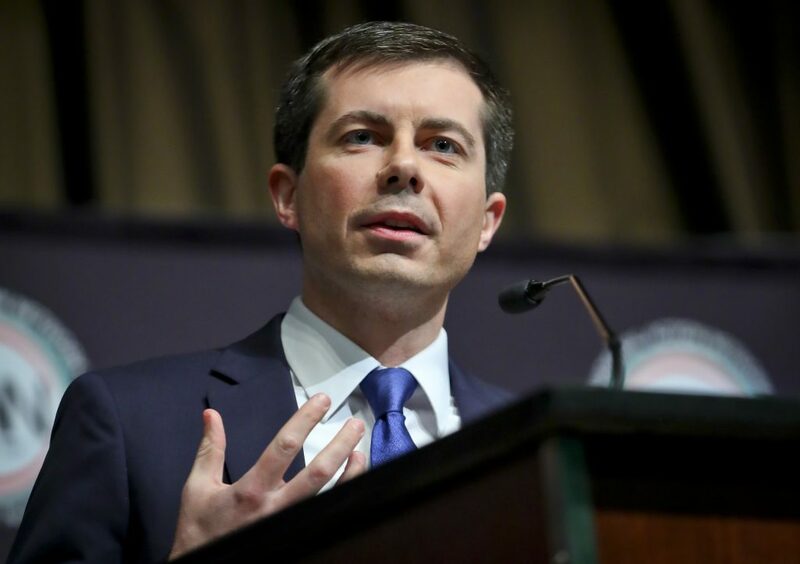 Buttigieg, the mayor of South Bend, Indiana, has the backing of 9 percent. He’s been campaigning in early states and is set to have a formal kick-off rally for his bid Sunday in his home city. Sens. Elizabeth Warren of Massachusetts and Kamala Harris of California are at 7 percent, followed by former representative Beto O’Rourke of Texas at 6 percent, Sen. Amy Klobuchar of Minnesota at 4 percent and Sen. Cory Booker of New Jersey at 3 percent. The remaining candidates and potential candidates tested were at 2 percent or less among likely caucus-goers. The Iowa survey was conducted April 4 through 9 with 351 Iowa voters who are likely to attend the Democratic presidential caucuses. The results have a margin of error of plus or minus 5.2 percentage points. A poll by the Saint Anselm College Survey Center at the New Hampshire Institute of Politics showed similar results, with Biden at 23 percent, Sanders at 16 percent and Buttigieg at 11 percent. Buttigieg saw the most growth in standing among the candidates since the poll was last conducted in February. He’s seen a 33-percentage point increase in name recognition since then, following a wave of national media attention in recent weeks. The Saint Anselm poll included 326 registered voters who indicated their intention to vote in the state’s Democratic presidential primary just more than a week after Iowa’s caucuses. It has a margin of error of 5.4 percentage points. For Democrats in 2020: Something Old or Something New? Clinton, Sanders Locked in Tight Races in Iowa, N.H.